A few things arrived in the post this week which deserved to be pictured. Way back in January, the Lawson chain of convenience stores ran a special Sengoku Basara 4 promotion with a bunch of cool prizes. I was over in Japan at the time the campaign began so I tried my hardest to win the cool Date Masamune alarm clock - and failed. However, in the end I managed to win one of the consolation prizes, which was a set of three A4 clear files. They finally arrived this week and I got to see them for the first time! The first clear file is the one pictured on the campaign page, showing the special artwork that was created for the HMV/Loppi store-exclusive game sleeve. I put some white paper behind the image to make it easier to see. The next file depicts the 'Production I.G. '-style Date Masamune again, this time in his Lawson uniform. 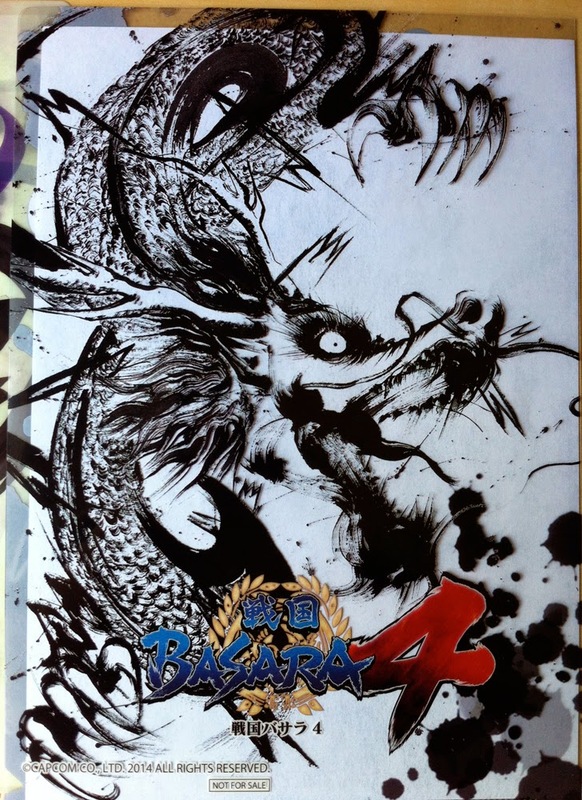 The reverse side has Masamune's Basara-e dragon artwork. 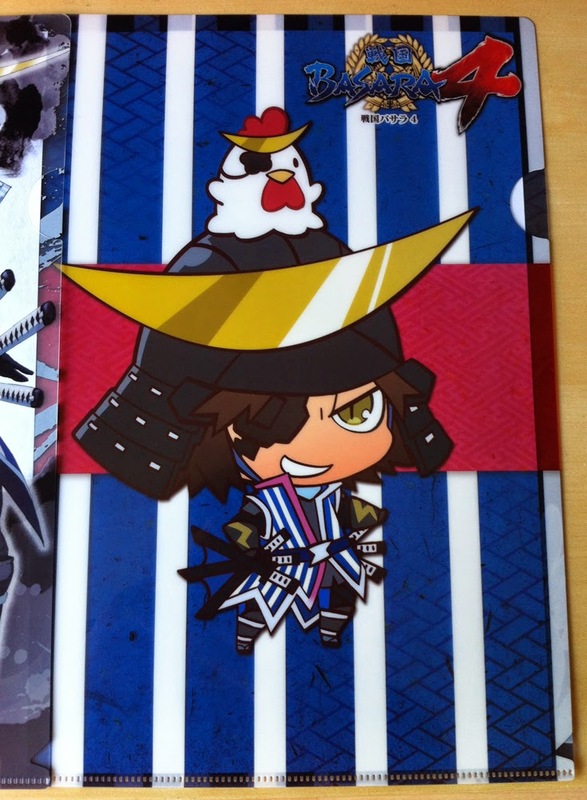 The last of the three clear files is a silly one, showing Masamune in Mame Sengoku Basara form with Lawson's Karaage-kun mascot perched atop his head. The same shipment also contained my Sengoku Basara 4 Basara Matsuri 2014 ~Shinshun No Utage~ DVD, which I'll review in the next week or two. 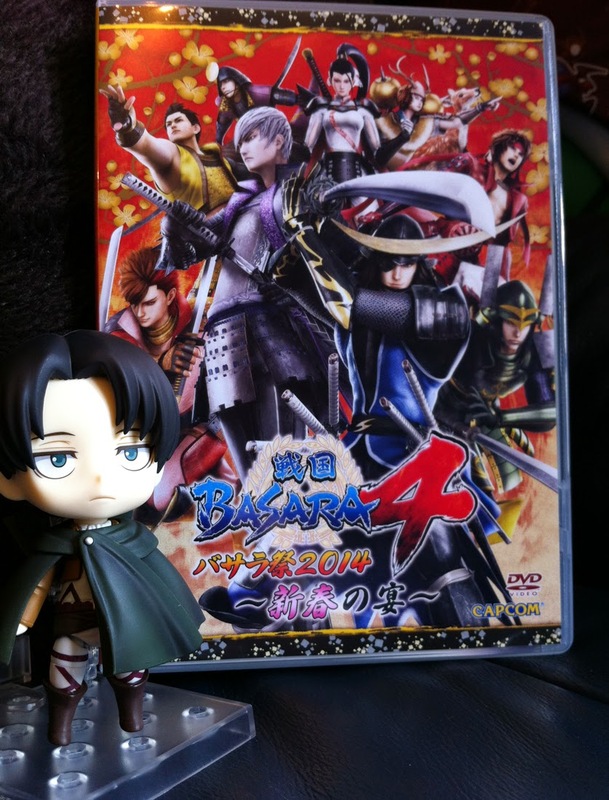 The Nendoroid figure of Levi from Shingeki No Kyojin (Attack On Titan) arrived separately - he was a bargain from the Crunchyroll store thanks to the discount coupon that was bundled with my last renewal. 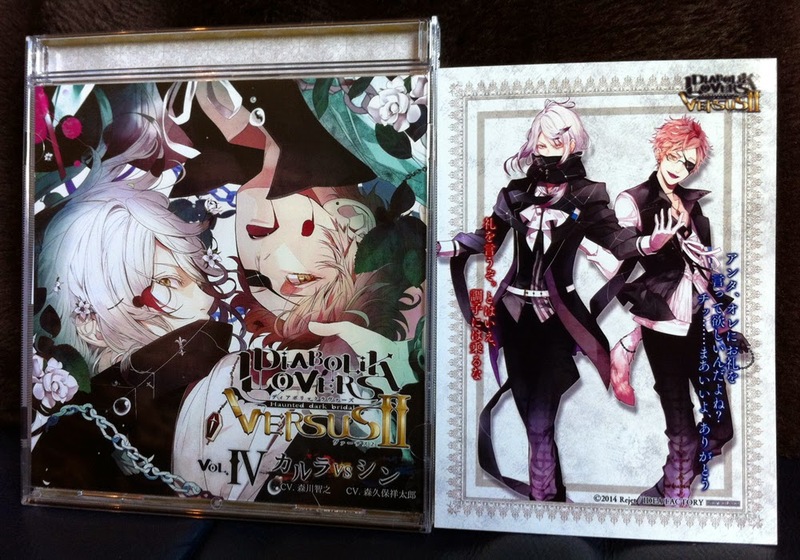 The last item is the Diabolik Lovers do-S Kyuuketsu CD: VERSUS II Vol. 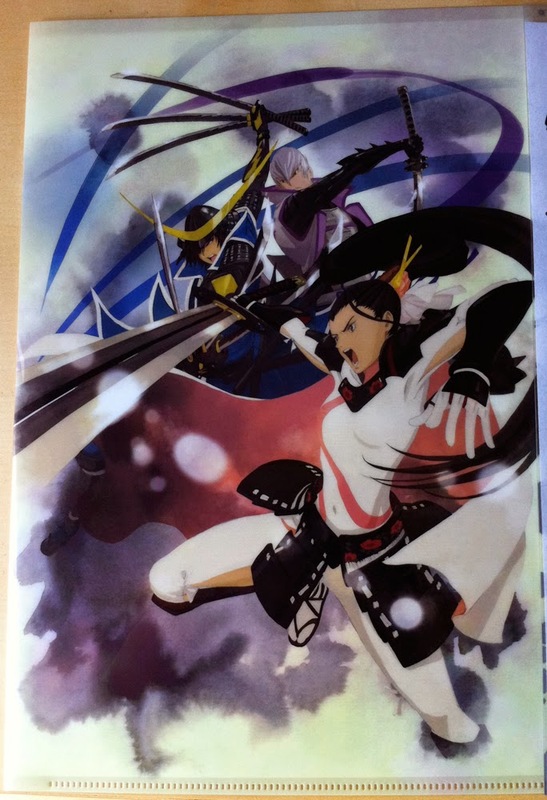 IV Carla VS Shin with its Animate-exclusive bromide. I haven't heard the new characters speaking before; it's a little exciting. I feel like there's a pretty big lack of support for DARK FATE in comparison to the previous releases (either due to personal opinions regarding the Tsukinami brothers, the whole "eclipse" effect aspect, or because Satoi won't be working on the artwork). 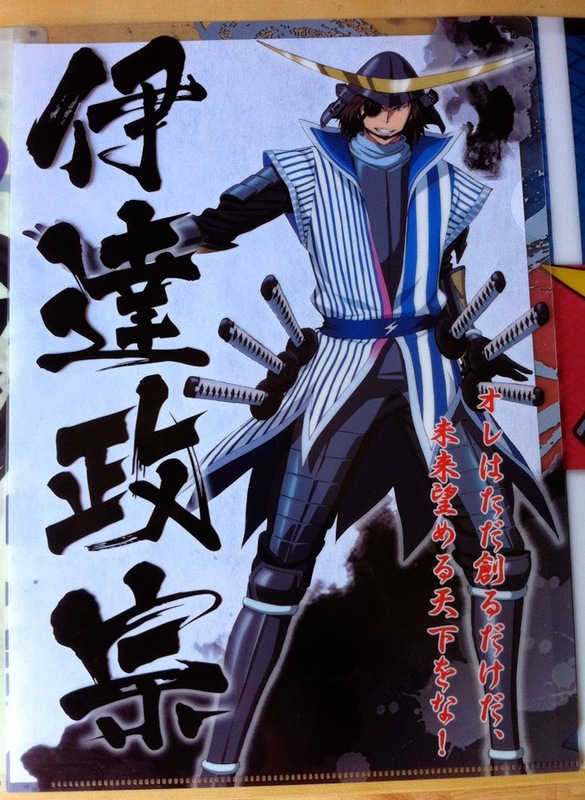 I'm actually more interested in Shin than anything else (I've developed a large bias towards him, heh), but the recent DF scans looked somewhat interesting. I've only had a quick listen so far during a distracting train ride, so I haven't had much chance to learn about the Tsukinami brothers. Since I've been avoiding most of the articles, my early impressions are that they're interesting and more menacing, the way that the Sakamaki brothers originally felt (the way that they were all humanised a little more in More, Blood undermined their scariness for me). It might just because the Tsukinami brothers are still new, or simply because they're brimming with so much pride, but they seem much more intimidating! Shin is the most interesting of the two for me so far too and I'm looking forward to getting the new CD series (it's coming from Stellaworth so I'll have to wait for another week or two). The other upcoming games seem to have pushed Dark Fate into the background, but it's the one I'm most excited about!